Ken Toye, Brooke Taflinger, Heather Cusick, Mike Smith and Jerry Haines were inducted into the Howard County Sports Hall of Fame Saturday night. The late Bob Rodibaugh was also inducted. For the ninth time, the Howard County Sports Hall of Fame welcomed new members to its exclusive ranks of the best athletes and coaches from the area. 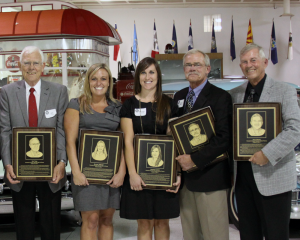 Hall of Fame President Steve Geiselman presided over the induction of Heather Cusick, Jerry Haines, Ken Toye, Mike Smith, Brooke Taflinger and the late Bob Rodibaugh during the annual banquet held Saturday night at the Kokomo Event Center. In addition, the late Bob Ford, award-winning sports editor of the Kokomo Tribune and local sports volunteer, was the second recipient of the Hall of Fame’s Distinguished Service Award. Heather Cusick enjoyed an outstanding career at Taylor and Kokomo high schools before extending that level of excellence at Miami of Ohio. Cusick played two seasons at Taylor, scoring 636 points, before transferring to Kokomo. Playing for the Lady Kats in 1998 and 1999, she led her team to a 45-5 record that included two NCC outright titles along with sectional and regional crowns. In her two seasons at Kokomo, Cusick scored 755 points and the Indiana All-Star, closed her four-year career with 1,391 points. The 5-foot-8 point guard is arguably the finest female player ever at Miami. She appeared in all 116 career games, starting the final 113. She left the program in 2003 as Miami’s career leader in points (1,728), 3-point baskets (230), field goals (604) and assists (596) while finishing No. 2 in career steals (307). She posted a career-high 36 points as a senior in Miami’s win at Michigan State. Cusick was named first team all-Mid-American Conference in 2002 and 2003 and was the MAC Player of the Year in 2002; runner-up in 2003. She was the only Miami player ever to be named all-conference in each of her four seasons. Cusick was a team captain three seasons and the university’s female athlete of the year in 2002. She is the MAC’s only player ever to have scored 1,700 points, while collecting 500 assists, 400 rebounds, 300 steals and 200 3-point field goals. A MAC all-academic selection, Cusick’s jersey number (5) has been retired. She played one season of professional basketball in the Netherlands and is now working as a graduate assistant in the University of Nevada’s women’s basketball program while completing her masters degree in counseling. Over the past two decades, Jerry Haines has turned Eastern High School softball into one of Indiana’s elite programs while winning the school’s only IHSAA team state championships. Haines has been involved in the Comets’ varsity program since its inception in 1984. He was an assistant coach to Walt Nicholson before taking over the program in 1995. In 17 years, his Comets have never had a losing season, winning two state championships – Class A in 2003, 1-0 over Tecumseh in 12 innings and Class 2A in 2005, 4-2 over Frankton. His teams have also won 11 sectionals and 4 regionals. He has also been selected to coach in the Indiana North-South All-Star series four times (1998, 2002, 2003 and 2005). Twelve of his players have participated in the series. Haines has compiled one of the finest won-lost records of any Howard County coach, at 381-107. Haines’ victory total is seventh best among all past and present state softball coaches. His teams’ best records came in the state championship years, 31-4 in 2003 and 31-3 in 2005. Haines is a lifelong Greentown resident, graduating from Eastern in 1960 where he participated in football and track. He graduated from Purdue University in 1965 and worked in engineering management at Delphi Corp. before retiring in 2000. Haines has also been the driving force behind all Eastern and Greentown softball having been heavily involved in the youth program for the past 28 years. Haines and his wife Ann have two daughters and four grandchildren. As cross country coach at Northwestern, Bob Rodibaugh led the Tigers to single class IHSAA team state runner-up finishes in 1970 and 1971 and he was voted Indiana cross country coach of the year in 1971. His teams captured nine Mid-Indiana Conference championships over a 12-year period (1963-74). Rodibaugh’s squads also won the first six Howard County cross country championships ever contested from 1968-73. Rodibaugh was head boys track coach at Northwestern for 10 years (1963-72) winning nine Howard County and four MIC titles. Before graduating from Pike Township in Marion County in 1947, Rodibaugh turned in fifth and second place finishes in the mile run at the IHSAA’s state track meet in 1946 and 1947 respectively. Rodibaugh then took his running talents to Purdue where he lettered six times in cross country and track. He is one of only two Purdue cross country athletes twice named All-American. Rodibaugh was team captain in 1950. He also lettered three years in track, competing in the mile relay and two-mile run. Rodibaugh’s college stay was interrupted with a two-year stint in the Army. While a member of the military, Rodibaugh won the 1952 International Army Meet’s 1,500 meter run at Copenhagen that drew entries from eight countries. He took second place at the same distance in the All-Army event at the University of California that same year, completing the course in his best time ever, 3:58.5, which converts to a 4:16 mile run. Rodibaugh graduated from Purdue in 1954, then taught and coached 35 years, 29 of those at Northwestern. He retired in 1989 and passed away in 2004. He is survived by his wife of 50 years, Wilda, and one son. An outstanding three-sport athlete, Mike Smith left his mark as a player and coach at Kokomo High School like few have. The 1965 graduate started as a linebacker and offensive guard on the ’63 and ’64 Kat squads that turned in 9-1 and 10-0 seasons – the latter squad thought by many to be Kokomo’s finest ever. While lining up as the team’s smallest starting lineman at 175 pounds, Smith nonetheless earned All-State honors as a senior on a squad that finished with the state’s No. 2 ranking. The Indiana State graduate played one season of football in Terre Haute before suffering a career-ending injury. Smith also played three seasons of varsity baseball at Kokomo as a catcher and third baseman. He excelled at all levels on the diamond. Smith played three seasons of American Legion baseball, four with the semi-pro Kokomo Highlanders and six more in Kokomo while playing at the state’s top level of fastpitch softball. A history teacher for 40 years at KHS, Smith was an assistant wrestling coach for five years and an assistant football coach for 15. After serving as assistant baseball coach for eight seasons, Smith was named head coach in 1982 and he directed the program for 17 seasons. While fashioning a 295-178 won-lost record, Smith led the 1985 Kats to a single-class IHSAA state baseball championship before guiding the ’88 Kats to a state runner-up finish. Smith and his wife Judy have two children and four grandchildren. In 2000, Brooke Taflinger became Kokomo High’s first female individual event IHSAA state champion by winning the 200 individual medley in 2:03.21, then capped the day by winning the IHSAA Mental Attitude Award. In her distinguished prep career, she appeared at the IHSAA state finals four times and registered six top three finishes. She won eight NCC individual titles and left the KHS program with seven school records (four in individual events and three on relays). She also netted North Central Conference records in the 200 freestyle, 200 IM and 500 freestyle as well as setting sectional standards in the 200 IM and 500 freestyle. Taflinger swam one season at the University of Florida before transferring to Indiana. At IU, she was a two-time Big Ten champion in the 400 IM and in 2003 established a Big Ten record at 4:12.43. In ‘03, she was her team’s top point producer as the Hoosiers won their first Big Ten Women’s Swimming and Diving Championship. Along with her victory in the 400 IM in’03, she finished 6th in the 200 breaststroke and 9th in the 200 IM. In addition to winning the 400 IM at the 2002 Big Ten meet, she was a member of IU’s 800 free relay that finished second. She also finished 8th in the 200 breaststroke. During her collegiate career, Taflinger set IU records in the 400 IM, 200 breaststroke and 200 IM and as a member of the 800 freestyle relay. She earned All-American status four times, was a first-team all-Big Ten selection in ‘02 and ‘03 and IU’s MVP in ‘03. She also participated in the Olympic Trials in 2000 and 2004. The daughter of Bruce and Shelia Taflinger, she is a recreation therapist for the city of Carmel working with the physically challenged. Ken Toye was a two-time IHSAA state champion hurdler at Kokomo High School and a state record-holder who later excelled in Big Ten and national competition. Toye won the 120 yard high hurdle event at the 1951 IHSAA state finals (:15.1). He repeated in 1952 with a :14.6 performance that was the fastest winning time in the 49 year history of the event. Toye also finished 2nd at the ’52 state meet in the 180 low hurdles. Toye then enjoyed an outstanding career at Northwestern University lettering three years for Coach Rut Walter, a former Kokomo track star and charter member of the Howard County Sports Hall of Fame. In 1954, Toye finished 2nd at the Big Ten indoor meet in high hurdles and took 3rd in low hurdles. At the Big Ten’s outdoor meet at Purdue that year, Toye was nipped at the wire in the high hurdles by NCAA champion Willard Thompson of Illinois. Toye claimed 2nd in the highs and 3rd in the lows. In a post-season Big Ten vs. Pacific Coast Conference meet, Toye placed second in the high and low hurdle events. While injuries sidelined Toye for much of the 1955 season, he bounced back as a senior in 1956, taking 3rd place in the high hurdles at both indoor and outdoor Big Ten meets. During his career, he competed twice in the NCAA Track and Field Championships, acquiring All-American status. In ’54 at the University of Michigan, he ran a lifetime best :14.3 to finish third nationally in the high hurdles and in ’56 at the University of California, he finished seventh. An inductee in the Indiana Association of Track and Cross Country Coaches Hall of Fame, Toye retired from Delco Remy in Anderson after 27 years. He has two sons, two daughters and six grandchildren. He and his wife Doris reside in Southport, N.C. This entry was posted in Baseball, Basketball, Eastern, High School, IHSAA, Indiana, Kokomo, Northwestern, Wildkats. Bookmark the permalink.